1. 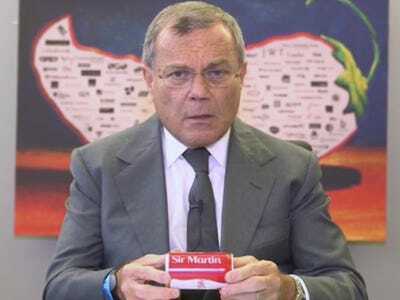 Advertising boss Martin Sorrell is facing a shareholder revolt over his record $100 million pay deal. Advisory firms are telling shareholders to vote against the WPP boss’ £63 million ($90.9 million) pay package for last year. 2. Publicis CEO Maurice Levy says the ANA report into agency transparency due for publication today today is going to be “unfair.” Mr Levy says the report, which is expected to reveal a general lack of transparency in the ad buying business, will cause financial and reputational damage to the industry because it will tar everyone with the same brush, rather than naming individual bad actors, The Wall Street Journal reported. 4. BuzzFeed is terminating its “significant” ad deal with the Republican Party because it doesn’t agree with Donald Trump’s campaign. The reported $1.3 million deal between the Republican National Committee and Buzzfeed had been signed in April, but since then, Trump has emerged as the party’s presumptive nominee. 5. The Supreme Court rejected Google’s appeal in the class-action lawsuit that claims the company deceived California advertisers. The decision means that litigation from advertisers who used AdWords between 2004 and 2008 could go ahead. 6. Verizon’s longtime “Can you hear me now?” pitchman has jumped ship to Sprint. Paul Marcarelli was known for his role as Verizon’s pitchman in the 2000s, but now he features in an ad for one of its biggest rivals. 7. Ad fraud is “second only to the drugs trade” as a source of income for organised crime, according to a new report. The World Federation of Advertisers claims that click fraud will become so rampant that it will cost advertisers more than $50 billion by 2025. 8. Hillary Clinton’s campaign attacked Donald Trump’s latest controversy by using his own surrogates against him. After Trump claimed that Indiana-born judge Gonzalo Curiel cannot fairly preside over lawsuits against Trump University because of his Mexican heritage, many leading Republicans condemned the presumptive nominee’s comments — Clinton is using these criticisms in her latest ad. 9. LG pulled off its craziest marketing stunt yet to promote its latest vacuum cleaner. US Extreme rock climbing medalist Sierra Blair-Coyle climbed a Korean skyscraper using two household LG vacuums. 10. Burger King is took a page out of Taco Bell’s playbook with a new mashup menu item. The Whopperrito is now available in Pennsylvania — it takes a Whopper and wraps it up in a flour tortilla.